Nicole Brandt, 2014 religion and the arts Belmont graduate and founder of Poverty and the Arts (POVA), was recently featured on “The Plus Side of Nashville.” As a social enterprise, POVA provides supplies, studio space, training and a marketplace for artists overcoming homelessness to create and sell artwork while gaining entrepreneurial and social skills. On “The Plus Side,” Brandt detailed POVA, how the idea was born and the ways she and her team are impacting the Nashville community. Growing up in a small town, Brandt said she had the opportunity to spend time with a homeless community weekly during her senior year of high school. Through the relationships she built there, a new passion was formed. When she moved to Nashville to attend Belmont, Brandt said she began attending church and volunteering for a homeless ministry where she passed out donations, but it was the chance to listen to each person’s story and experiences that impacted her most. 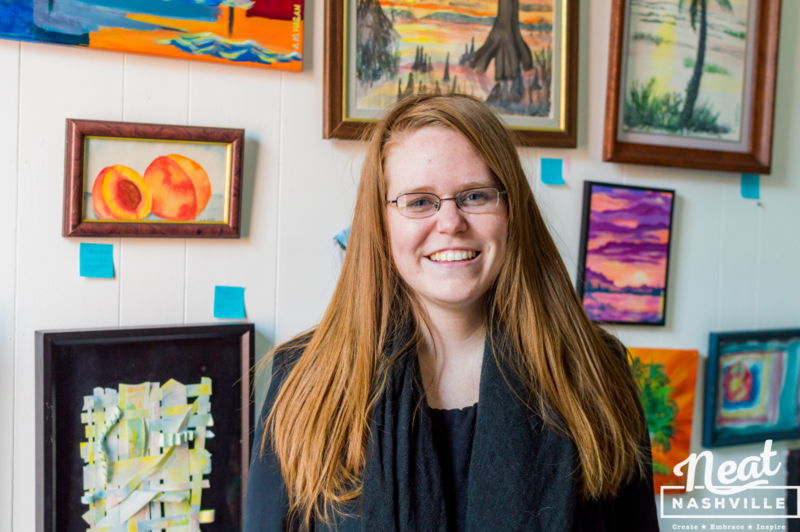 Soon after, Brandt worked alongside Room in the Inn to host her first POVA event where Belmont students participated in visual art, music or creative writing with members of the un-housed community. Thanks to a positive response from participants, Brandt continued hosting POVA events each semester through her position at Belmont. As graduation approached, Brandt began to realize she might have found just what she was looking to do professionally. Seeing significant talent but a lack of resources in the community, Brandt launched POVA’s Artist Collective in May 2014. Seeking to provide the resources needed to allow homeless individuals the opportunity to create art, the Collective provides an opportunity for artists to create and sell artwork as a way to earn income for themselves. “This supplemental income, made possible by their creative skills, provides greater autonomy in their day-to-day lives and allows the artists the opportunity to take control over basics like where to eat, how to get around or who to spend time with,” Brandt said. Now, POVA has served 20 artists total, 9 of which have transitioned into housing since joining the programming. The organization has secured a rental property and transformed it into a Studio and Gallery in Wedgewood-Houston, allowing them to participate in the neighborhood’s monthly art crawl and provide ongoing exhibition opportunities to their artists. Long-term, Brandt and her team hope to expand their services and increase the number of artists they serve. In addition to purchasing their own studio and gallery in the next five years, POVA hopes to provide transitional housing to their artists in the next 10 years. “By understanding the ways in which environment drives behavior, we know that our artists have the greatest possibility of succeeding when we can provide them an environment which includes a space to live, breathe, sleep and be,” Brandt said. They also hope to increase their revenue streams, and artists’ income, by expanding to retail, corporate art and teaching artist grants.